Miranda's Mumbles, Murmurs and Mutterings: Are you a Twit? When Twitter first appeared on the scene, I didn't understand it and I didn't even want to try and learn what it was and how it works. I had an account but it lay dormant with no activity at all for quite some time. It didn't take long to learn what trends and hashtags meant and before I knew it, I had fallen for it, in quite a bit way. I am now a Twit. Tweeter. Twitterer. However you want to call it, I now love tweeting. In the same way that I love writing my blog. 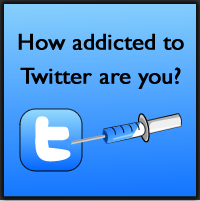 I've considered setting up "Twitter Addicts Anonymous" because I don't think its just me that loves it. Having said that, I do love it but I don't think I am addicted i.e. I think I could manage without it. I have observed many people who tweet much more than me. Much more. 1. We admitted we were powerless over Twitter - that our lives had become unmanageable. 12. Having had a spiritual awakening as the result of these steps, we tried to carry this message to TWITTERHOLICS, and to practice these principles in all our affairs. We've all become obsessed with checking who has unfollowed us (there is a website which tells you - I admit I have used it) - as if it really matters that the caravan retailer that followed you two months ago has given up reading your despair over the shock results from the X Factor or complaints that a university lecture has dragged on for longer than necessary... - how did they find me and why did they press follow in the first place?! On another Twitter note, this week OneMoreMum wrote a piece about Twitter and Triggers and I share many of the same thoughts as her. I don't enjoy scrolling through my newsfeed reading endless tweets from people who I follow begging celebrities for a RT (retweet) or follow. "I worry about whether it is always a safe place for those trying to stay recovered, whether it would be a betrayal to say Actually, I’m ok now. I don’t have anorexia any more. I eat normally. But I am still a really fascinating person – there are a thousand other things about be that define me far more than the mental illness I once had. I don’t know."